, corresponding to C terminal amino acids 848-865 of CD133. Our Abpromise guarantee covers the use of ab16518 in the following tested applications. Fix with 3% paraformaldehyde for 20 min at RT. WB 1/1000. Detects a band of approximately 120 kDa (predicted molecular weight: 97 kDa). ab16518 staining CD133 in human hepatocarcinoma (HC) tissue by Immunohistochemistry (Formalin/PFA-fixed paraffin-embedded sections). 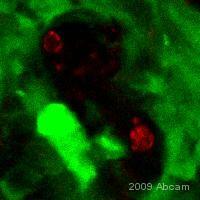 ab16518 was peroxidase-conjugated to the secondary antibody, followed by AEC staining. ab16518 recognizes 97 kDa human CD133 in Y79 cells. 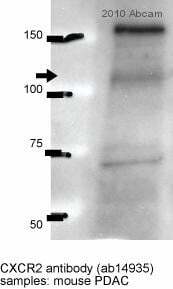 Band is at ~120 kDa due to protein glycosylation. ab16518 recognizes 97 kDa human CD133 in Y79 cells. Band is at ~120 kDa due to protein glycosylation. 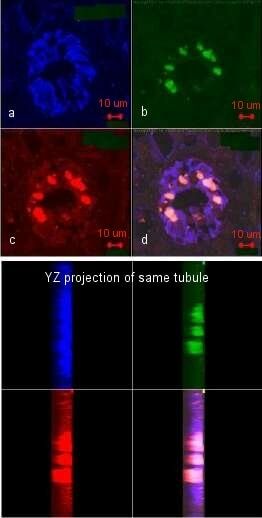 IF staining for nestin and CD133 using CD133 antibody (ab16518) in primary human kidney cells isolated from the loop of Henle of human kidney papilla. The cells were fixed with 3% paraformaldehyde for 20 min at room temperature. CD133 is red (c), nestin is green (b) and blue channel is beta-catenin used as a cell membrane outline (a). 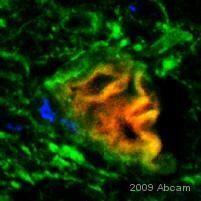 Image d shows the merged image of all three. CD133 antibody (ab16518) at a dilution of 1:100. IF staining of CD133 in cultured primary human kidney cells isolated from the human papilla. The cells were fixed with 3% paraformaldehyde for 20 min at RT. 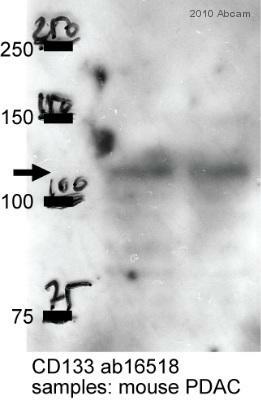 CD133 antibody (ab16518) was used at dilution of 1:100. Paraformaldehyde-fixed mouse mammary carcinoma tissue stained for CD133 (red) using ab16518 at 1/100 dilution in immunohistochemical analysis. 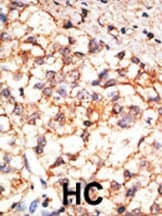 ab16518 staining CD133 in Mouse pancreatic neoplasia tissue sections by Immunohistochemistry (IHC-Fr - frozen sections). Tissue was fixed with acetone/methanol (1:1) and blocked with 10% serum for 1 hour. 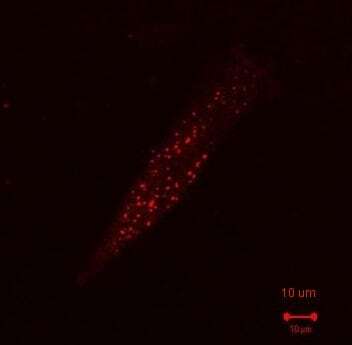 Samples were incubated with primary antibody (1/100) for 8 hours at 4°C. 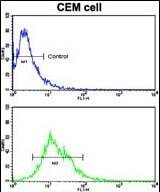 An Alexa Fluor®555-conjugated goat anti-rabbit IgG polyclonal (1/500) was used as the secondary antibody. Flow cytometric analysis of CEM cells using ab16518 (bottom histogram) compared to a negative control cell (top histogram). FITC-conjugated goat-anti-rabbit secondary antibodies were used for the analysis. Publishing research using ab16518? Please let us know so that we can cite the reference in this datasheet. I know you had to discontinue ab16518 (rb pAb anti-CD133) but I found a vial at the lab and wish to test it. Could you send me the datasheet? Probably it´s expired but in my experience it should still work. Thx. Das Datenblatt finden Sie im Anhang, leider etwas "zerstückelt", da unser System keine PDF von einem unveröffentlichten Antikörper herstellen kann. to CD133- Stem Cell marker- (ab16518) von Ihnen für unsere Versuche genutzt. Antikörper für humane Zellen geeignet, nennen? Leider können wir aus lizenzrechtlichen Gründen keinerlei anti CD133 Antikörper mehr anbieten. Wir haben unser möglichstes getan eine Lösung zu finden und die sehr populären Antikörper weiterhin anbieten zu können, sind aber nicht erfolgreich gewesen. Wir entschuldigen uns vielmals die dadurch verursachten Umstände.